MASON, Ohio (Ticker) -- Rain delayed play Wednesday at the Tennis Masters Series Cincinnati but it did not cool off American Andy Roddick against German Nicolas Kiefer. Roddick, the defending champion and No. 2 seed, beat Kiefer for the third time in as many weeks, 6-4, 6-4, in the second round of the $2.2 million hardcourt event Wednesday night. Roddick, who is looking to become just the third player to successfully defend his title here, beat Kiefer in the final of Indianapolis two weeks ago and in the semifinals of Toronto last week. Rain delayed the start of play Wednesday for four hours. When play finally got underway, No. 4 Carlos Moya of Spain overcame 23 aces by Ivan Ljubicic to edge the Croatian, 6-4, 4-6, 6-4, and No. 10 Lleyton Hewitt of Australia beat Brazilian Gustavo Kuerten, 6-3, 6-4. 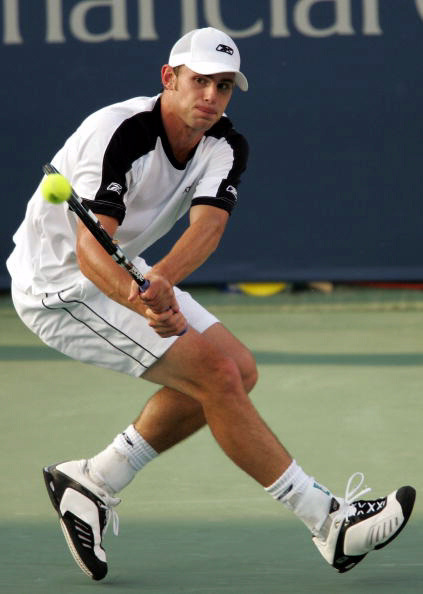 Less fortunate was ninth seed and French Open champion Gaston Gaudio of Argentina, who fell to No. 9 Greg Rusedski of Great Britain, 4-6, 7-6 (7-3), 6-4. Dominik Hrbaty of Slovakia, who ended top seed Roger Federer's 23-match winning streak Tuesday, fell to Swede Jonas Bjorkman, 6-7 (6-8), 6-3, 6-3. In the featured night match, No. 11 Andre Agassi of the U.S. will play Thomas Johansson of Sweden.